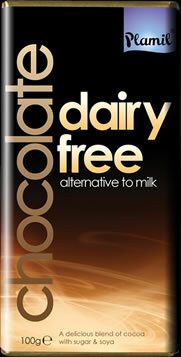 Gluten free chocolate, without milk, eggs, soya, dried fruits or artificial sweeteners.. May contain traces of soya. Plamil is a 100% vegan brand. Ingredients: sugar* (35%), cocoa butter*, rice powder (rice syrup, rice starch and rice flour)* (20%), cocoa mass, emulsifier: sunflower lecithin. *Ingredients of organic origin. Organic certification UK5 by Soil Association. 77% ingredients fair tradre. whith 42% cocoa. The producers of cocoa and sugar used in this chocolate receive a fair and stable income. 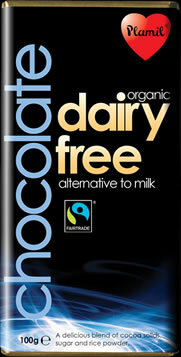 A natural and delicious alternative to milk chocolate.